If you or a loved one suffers from hearing loss, you might want to invest in a piano or another musical instrument. The above sentence may sound like nonsense, but research has shown that playing a musical instrument when younger can pay dividends later in life with improved auditory abilities including better understanding of speech in noise. Newer research indicates that starting an instrument later in life may also provide some benefit. Combined with hearing aid usage, learning to pluck guitar strings or play a trumpet may improve your sense of hearing and boost your confidence in social situations. Let’s take a look at what this exciting new research finds and what it means for people with hearing troubles. Musicians train their ears to pick out singular frequencies and sounds from an arrangement of instruments and voices. This skill is valuable for anyone who uses a hearing aid. Those with hearing impairments often have difficulty distinguishing specific sounds or voices from background noise. When these patients learn to play an instrument, they start to pick up a musician’s knack for parsing sounds and focusing on specific voices. 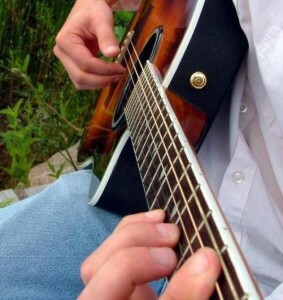 Musical practice could improve the practitioner’s ability to detect and parse sounds. Social situations can be disheartening when you can’t listen to conversations or distinguish voices from background noise. Even if you use a hearing aid, training your ear with musical practice can improve your social experiences. Many patients avoid social situations due to their inability to listen. This isolation and lack of confidence can cause the hearing impaired to develop anxiety or depression. Regardless of the intensity of your hearing difficulty, playing any kind of instrument may restore your confidence when you spend time with friends and loved ones. By helping you hear better, your new musical talents could improve your social life and psychological health. It seems counter-intuitive, but playing music really might improve the lives of anyone suffering from hearing loss. While getting a hearing aid is the first step to improving your ability to hear, strumming a guitar or jamming on a saxophone might contribute to significantly improved hearing.